Students are proven to lose over 20 percent of their school skills during the summer! This means that when schools start again in the fall, most students are behind, and need to take time to catch up and relearn information that they had already learned! One way to prevent this from happening to your children is to enroll them in a summer program to continue their learning over the summer! Southern Methodist University offers CSI and Engineering camps for students ranging from 6th to 12th grade! SMU’s CSI Camps are three days long, and students explore science and technology behind identification and crime solving! The camp also has guest speakers which have included FBI Agents, Police Officers, the SWAT Team, and more! Activities for the kids include a mock crime scene, fingerprint dusting, DNA extraction, and Paper Chromatography! There are four sessions offered for the CSI Camps, two for girls and two for boys, and the student must be entering the 6th or 7th grade. More information about CSI camps can be found here! Applications for the CSI Camps are now open, and they can be accessed here! 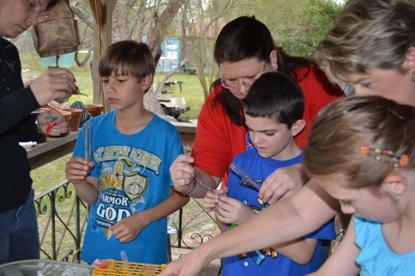 Lyle Engineering Camps are offered for students ranging from 7th through 12th grade. The camp for incoming 11th and 12th graders is a residential camp, and it gives students opportunities to be mentored by representatives from the SMU community. The students will join in panel and group discussions, and they will be working on a hands-on project in the Deason Innovation Gym. The camp for 7th through 10th graders is designed to help students explore all disciplines of engineering offered at the Lyle School of Engineering by participating in hands-on projects! More information about Engineering Camps can be found here! Applications for Lyle Engineering Camps are now being accepted, and the 11th/12th grade application can be found here, while the 7th/8th grade application can be accessed here! Another great summer program for is the iD Tech summer program for girls! This program is for girls aged 7 to 17, and focuses more on computer science. Girls will create apps and video games, build robots, code with C++ and Java, and more! They even offer scholarships! More information about this camp can be found here! Are you looking for a fun theme for a Kid’s Birthday Party? Well let me tell you about one! 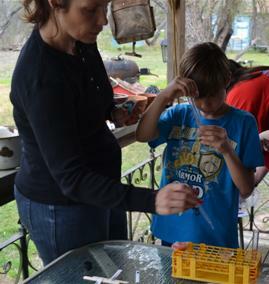 My friend Debra threw her son a science/Minecraft themed birthday party. Science you ask? 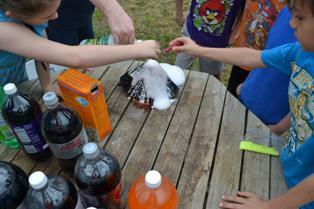 Yes, science is a great party theme for kids who love to do experiments! 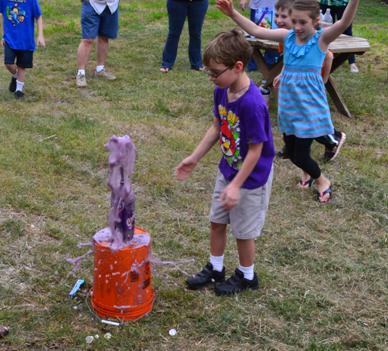 We did the following experiments with a group of his friends: made green slime, paper chromatography, made a volcano, found strawberry DNA, and tested different types of sodas to see how they exploded with Mentos. 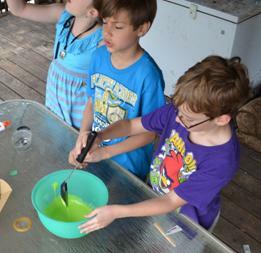 Green slime: it’s fun, it’s gooey, and it’s science! 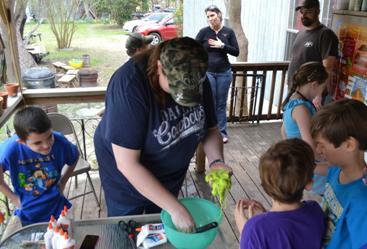 What kid doesn’t like playing with slime? Making it is really easy too! You can even choose what color you want to make it by adding different colored food coloring to your gooey mixture! Paper Chromatography – What colors make up different brands of black markers? 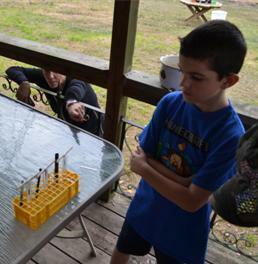 This experiment leaves kids amazed! 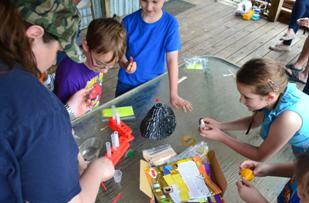 Let’s make a volcano! How much of each ingredient do you need? Strawberry DNA – It’s stringy! 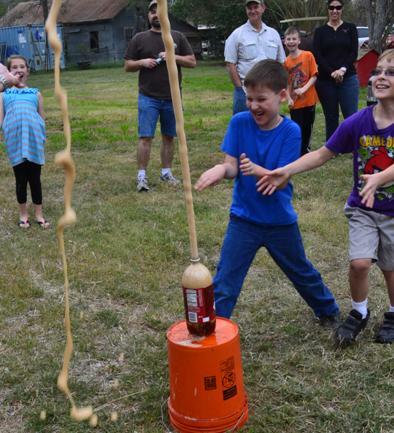 What happens when you drop Mentos in orange soda, root beer and grape soda? We also tried Coke and Diet Coke. We got to see which soda shot up the highest! We all had so much fun with these experiments! It was definitely messy but so cool! The kids learned a lot, and it was a great experience for everyone!